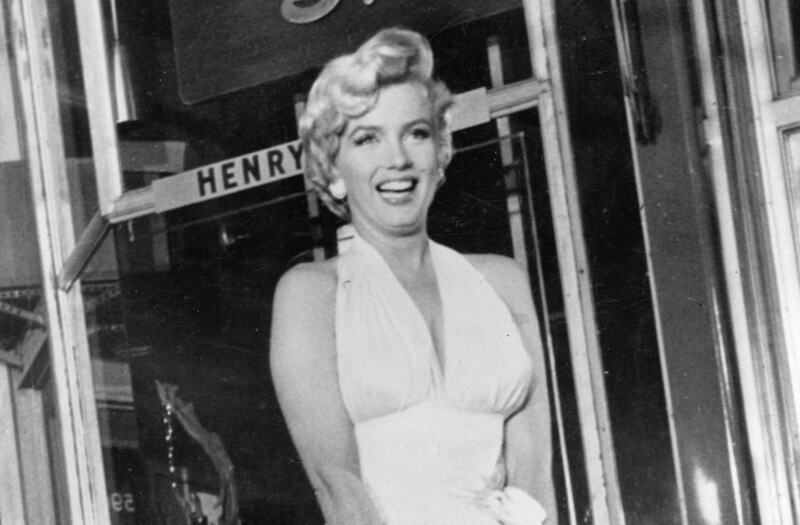 The scene from "Seven Year Itch" in which Marilyn Monroe's white cocktail dress gets buffeted up to her waist is one of the most iconic in film history, but now, thanks to some old home-shot footage of the scene being filmed, you can see the moment and the events surrounding it in a different light. On Sept. 15, 1954, director Billy Wilder and Monroe were scheduled to shoot the scene on a New York sidewalk, however, the crowd of journalists and onlookers, including Monroe's then husband Joe DiMaggio who famously hated the dress and rowed with the actress after shooting, grew so great and rowdy, that they were forced to re-shoot the actual scene on the 20th Century Fox lot. Also among the crowd that day was a man named Jules Schulback who followed Monroe and captured the scene on film. Schulback's illuminating footage has been edited down to a 12-second video on the New York Times website. Marilyn Monroe with Joe di Maggio, 1953. In an interview with the New York Times, Siegler's older sister Rayna Dineen revealed that Schulback always told his family stories of the moments he had captured on film, but that they had never truly believed him until they found the footage in 2004. Siegler and Scher proceeded to screen the film for the family, and then for a group of around 100 people. Now, a short clip from the film is available for people outside the family to see for the first time, however, it is unclear when the full, unedited footage will be made available.The footage was discovered by his granddaughter Bonnie Siegler and her husband Jeff Scher in a plastic bag filled with old films Schulback had made of family trips, bar mitzvahs and, so it happened, the famous subway grate incident with Marilyn Monroe. The original short film lasts 3 minutes and 17 seconds, features humorous title cards which Schulback had spliced in, and captures Monroe in a second-floor window blow-drying her hair. It then cuts to the iconic star standing on the subway grate preparing to film the scene. Schulback must have been remarkably close to the action, as in some of the shots you can even make out Wilder's arm as he gives out instructions, while in another the director walks in front of the camera before Monroe's dress starts to flutter a bit too high for her liking, and with her co-star Tom Ewell looking on, the actress smiles her pearly white smile as she tries to pin it down.